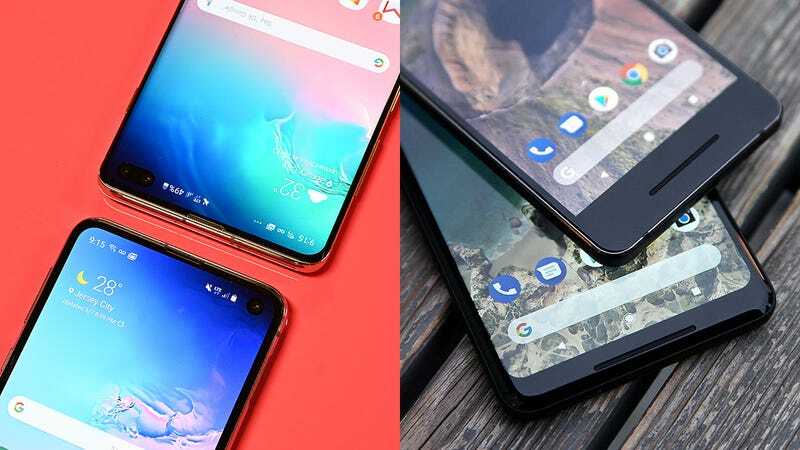 Picking a smartphone isn’t just about picking between iOS and Android because if you choose Android you also need to weigh up all the different flavors of Android on the market. Google, Samsung, Sony, LG, OnePlus, HTC, Motorola and the rest all do Android differently, and Samsung recently revamped its own mobile OS under the One UI banner. Most of stock (Pixel) Android’s aesthetic appeal is on the home screens and the app drawer—once you get into the menus and the dialog boxes everything is rather utilitarian rather than pretty. With Samsung’s One UI, that attention to detail goes a little deeper, into menu headings and dialog boxes and icons. Take, for example, the floating bubble-style entries on the Settings menu in One UI compared to the very regimented listing that you get on the Pixel phones. In terms of theming and customization, Samsung has the upper hand here, although we’ve just seen the first signs of theming appear in Android Q. The One UI has a Wallpaper and themes entry on the Settings menu that has no equivalent on stock Android on the Pixels, so you’ve got a lot more options to play around with. Take the Easy mode, for example, giving you a more basic, stripped-down interface with a single tap; or the way you can change the order of the navigation buttons if you prefer them to gestures. These customization options aren’t new with One UI, but they’re more accessible and more useful than ever. There’s not as much customization to be had on the stock version of Android that ships with the Pixel phones, which may or may not bother you. You don’t get as much control over the lock screen, for example, or the always-on display, so if you do have the time and inclination to go to town on phone tweaking them Samsung One UI feels like a better bet. Almost every app and operating system makes use of a dark mode now, and One UI is no different. It’s well implemented, covering all of the menus and dialogs, as well as Samsung’s own provided apps (though not the third-party apps that we tried). Dark mode is slowly making its way to stock Android too, with a rudimentary switch in Android 9 Pie and the promise of more in Android Q, but it’s not as sophisticated as it is in One UI. On the strengths of the software packages alone though, in their current forms, it’s hard to find a clear winner—ideally we’d want a mostly stock Android with a few of Samsung’s best innovations sprinkled on top. We still just about prefer using a Pixel phone, not least for the easy Google account, Google app and Google Assistant integration, but One UI closes the gap even further. This might be the best version of Samsung’s flavor of Android yet.